Revolution Gear and Axle D30, 4340 Chromoly US Made Front Axle Kit for 1997-06 Jeep Wrangler TJ, LJ, Cherokee XJ without disconnect and Grand Cherokee ZJ, SUPER 30, 30 Spline Upgrade kit without Locker. All Revolution Jeep Front Axle Kits come with 2 US Made 4340 Chromoly inner axles, 2 US Made 4340 Chromoly outer stub axles, 2 Dana Spicer 5-7166X U-Joints and 8 Full Circle Snap rings to hold it all together. 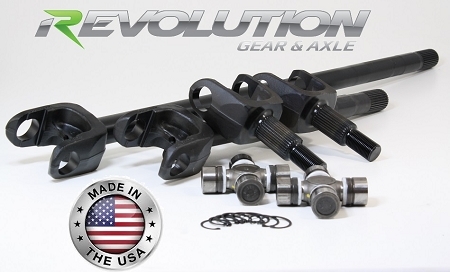 Revolution uses the large 1350 Style U-Joint for all of our Jeep applications. Using the substantially larger inch1350 inch Style U-Joint provides a substantial increase in strength over the smaller 5-760X U-Joint and allows extra clearance for tighter turning. All Revolution Axles are backed by a fantastic lifetime warranty against failures, including but not limited to U-Joint failure.